“Pentecost Has Come,” roared the September 1906 headline of the Apostolic Faith newspaper, published by an obscure mission on Azusa Street in Los Angeles. New Testament Christianity finally was being restored to its charismatic fullness: “The gift of languages is given with the commission, 'Go ye into all the world and preach the Gospel to every creature. 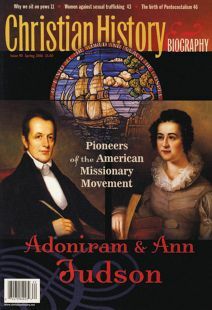 '” Indeed, those who experienced “Pentecost” at the revival claimed that they spoke in Greek, Italian, Chinese, Japanese, Zulu, “dialects of India,” Chippewa, and many more languages. While one Los Angeles paper decried this “Weird Babel of Tongues,” the faithful at Azusa declared that God had bestowed these unlearned human languages so that they could speedily evangelize the world before the coming of Jesus Christ. April 2006 marked the centenary of the Azusa Street revival, an event that was crucial to the major global awakening we now call Pentecostalism. From the barrios of Latin America to the house churches of China and the villages of Africa, all the way to the corridors of the Vatican, its impact has been felt. Yet many still wonder how the goings-on at the Apostolic Faith Mission could have changed the face of 20th-century Christianity. Best known of the early formative Pentecostal revivals, it began in an unlikely location, a little house tucked away on North Bonnie Brae Street. The pastor of the largely African-American congregation, William J. Seymour, had arrived only a few weeks before from Houston, where he had been mentored by Pentecostal pioneer Charles Parham. During a prayer meeting in this North Bonnie Brae Street house on April 9, 2006, a member of the congregation began speaking in tongues. Others followed suit. It seemed that the Day of PentecostActs 2:4!had been reborn in their midst. News spread quickly, and the crowds grew. Many sought the Pentecostal baptism; others came simply to observe the unconventional services. Furthermore, premillennial eschatology left little time for evangelism before the imminent return of Christ. Hence, these evangelicals believed that the Spirit's intervention, bringing the same miraculous “signs and wonders” that accompanied gospel proclamation in the Book of Acts, would empower missionaries to reach the nations with the gospel before it was too late. Sharing this outlook, a burgeoning diaspora of Pentecostal missionaries went abroad from Azusa and other key centers of Pentecostal revival. They numbered more than 200 by 1910, with the majority being women. Confident of the Spirit's enablement, they preached, prayed for the sick, and exorcised demonic spirits. Azusa Street left a deep imprint on the collective memory of the Pentecostal movement, crafting a heritage that later would inspire majority world Pentecostals because of its egalitarian character and the dispensing of supernatural gifts for the building of Christ's church. Pentecostals' confidence in the restoration of charismatic Christian spirituality, along with the charismatic renewals that subsequently followed, challenged virtually every sector of Christianity to re-evaluate its understanding of the role of the Holy Spirit in the mission of God in the world. Gary B. McGee is professor of church history and Pentecostal studies at Assemblies of God Theological Seminary in Springfield, Missouri.